The value of a Armistice, 1918-1968 - 15 cents 1968 stamp depends on several factors such as quality and wear, supply and demand, rarity, finish and more. Values in the section are based on the market, trends, auctions and recognized books, publications and catalogs. This section also includes information on errors and varieties and characteristics. For the 50th consecutive year, Canadians from the Atlantic to the Pacific paused on November 11th to pay silent tribute to those who have died defending their country. The 11th hour of the 11th day of the 11th month is a yearly moment in time symbolizing a nation's gratitude. 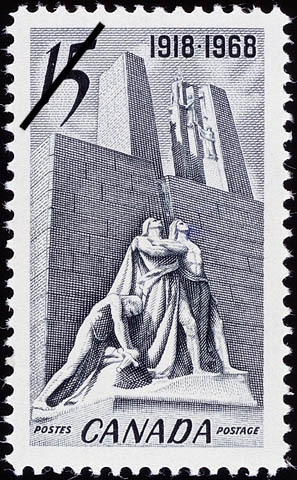 The Canada Post Office commemoration of the 50th Anniversary of the World War I Armistice graphically portrays The Defenders and the Breaking of the Sword, one of many sculptured groups decorating the massive Canadian Vimy Memorial; located on Vimy Ridge, near Arras, France, the monument was unveiled and dedicated July 26, 1936. This symbol of Canada's remembrance, designed by W.S. Allward, Toronto, Ontario, has classic twin shafts which dominate the countryside; 125 feet high on a base 200 feet square, it is a focal point on 250 acres deeded to Canada in perpetuity by France. Inscribed theron are the names of 11,285 of Canada's 1914-1918 war dead who have no known graves. At Eastertime in April 1917 the Canadian Corps of four divisions, fighting as a unit for the 1st time, launched a meticulously planned offensive amidst sleet and snow to seize the strategic Vimy Ridge. Commanding an escarpment 9 miles long this was one sector of the Allied Front which did not yield in subsequent attacks. Historians refer to the military success at Vimy Ridge as a point in history where Canada emerged from a semi-colonial status to that of full nationhood. Of the 645,925 Canadians who served in World War 1, 66,655 paid the supreme sacrifice; World War II saw 986,936 in the forces, of these 44,893 were fatal casualties. Population figures for Canada during the two wars were approximately 8,000,000 and 11,000,000 respectively. Books of Remembrance in the Peace Tower, Ottawa, list 112,000 Canadians who have died for their country since 1867.